I believe that being a newborn photographer means so much more than just taking photographs of newborns. I am a fine art newborn specialist, who appreciates the fine art photographic style of creating beautiful professional images. I love working with clients who value the creative aspect of this style of photography. 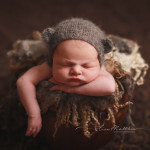 Newborn sessions begin with a session fee of $200. This amount serves as your newborn deposit as well. It covers my assistant fee, the creative fee, the use of all my props and equipment, as well as the time in the studio. Included in this is 20-30 beautifully hand edited images presented in a password protected online viewing gallery. ***This does not cover any prints or digital images. Once you have seen your baby’s gallery, you can decide which one of the available collections best fits your needs. Collections start at $350.